Sienna Parker was one of eight SESP undergrads to receive an Academic Year Research Grant. Eight Northwestern University School of Education and Social Policy students received 2017-18 Academic Year Undergraduate Research Grants (AYURG) to study everything from sound bathing, a mind-body practice that utilizes gongs and meditation, to the development of depression among urban preschoolers. 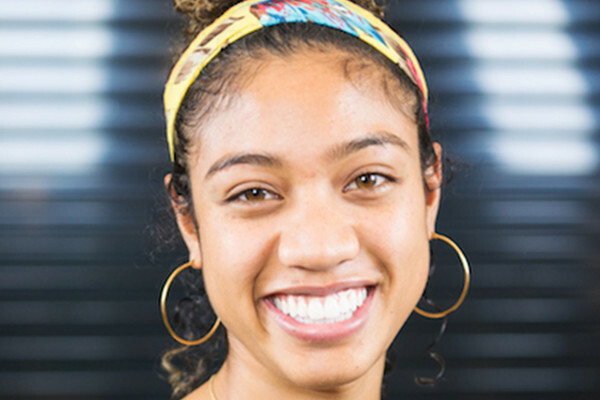 Winners include sophomore Jordyn Ricard, who won her third research grant in two years; senior Imani Wilson, a two-time winner; Sumaia Masoom; Joshua Inwald; Sienna Parker; Jamila Silver; Cesar Almeida; and Camille Cooley. Ricard’s third grant will allow her to code for emotions such as sadness, anger, interest, and joy by introducing the Specific Affect Coding System into her research, which looks at emotions and marital satisfaction. Past research in this area of human emotion has focused on predominantly white, middle-class couples. Ricard is exploring whether the relationship is particularly strong for couples from lower socioeconomic backgrounds due to the extra financial stresses. Ricard became the first member of Claudia Haase’s Lifespan Development Lab to become a certified facial coder. She’ll be mentored by graduate students Emily Hittner, Ryan Svoboda, and Jacquelyn Stephens. Wilson, who previously won a summer research grant, is interviewing black teachers about their experiences, attitudes, and beliefs to better understand the relationship between professional and personal identity. “Attrition rates for black teachers across the nation are extremely high, which is concerning due to the positive effects that black teachers have on their students and schools,” said Wilson, who was motivated by her third-grade teacher, one of the few black teachers in the school district. Inwald is studying discrimination and perceived objectivity by looking at self-objectivity, or fair and honest self-evaluations, which help determine shortfalls and strengths in an effort to improve. He suspects those who are able to think more self-subjectively are less likely to discriminate or act on stereotypes and prejudices. He’ll test his theory by asking study participants to assume the role as a hiring managing and select candidates for a hypothetical job opening. In addition to learning and organizational change, Inwald is majoring in statistics and psychology and pursuing a certificate in managerial analytics through the Kellogg Certificate Program for Undergraduates. Masoom is studying Islamophobic rhetoric in the last election cycle and its effects on college students in America. She is focusing on the psychosocial effects of hearing rhetoric about “banning” one’s religious identity and constant conflation with discussions about terrorism. “Understanding these effects is particularly important on college campuses, which have historically been the bastion for ideas deemed too “offensive” for the general public, leaving students on the frontlines of the debate over what qualifies as discriminatory speech,” Masoom said. Parker is researching sound bathing, an alternative practice that involves meditation and introspection through the hearing and feeling vibrations of percussion instruments, including gongs, crystal bowls, and chimes. She hopes to shed light on the mind-body-spiritual needs of people who participate in sound baths, against the larger context of the contemporary health and wellness-consumer landscape. Silver is studying the prevalence and development of depression among urban, low-income preschoolers, focusing on factors such as the child’s personality, life experiences, and family environments. In addition to identifying how the conditions that contribute to the vulnerability of depression in this age group, she hopes her research will provide a platform for better, earlier intervention and support. Almeida is working to preserve traditional Ghanian music by creating sound packs or sample libraries of the music and instruments to archive and make accessible to others. His research involves exploring whether the complexity of the Ghanian music can be captured in the technology and structure of a sound pack. Almedia plans to use his experience to further his work with Solidarity Studios, a non-profit that builds mobile production studios around the world to build solidarity through music production and community collaboration. Cooley will look into the efficacy of new policies designed to help those caring for people with intellectual or developmental disabilities. In 2015, Illinois implemented “person-centered care” to increase the quality of life for those with special needs. But for guardians or caregivers, the policies are complicated and can still fail to provide necessary services. Her research involves looking at how families and guardians define and understand “quality of life” for their charges. She will also find out if the health services they receive match their expectations.